Read our 10 Step Guide Series. 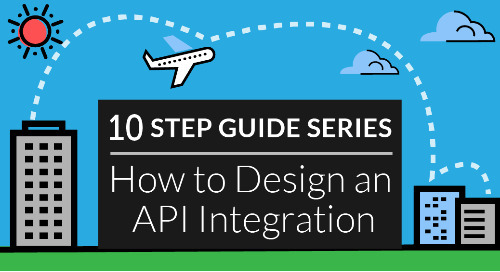 10 in-depth steps to designing, managing and integrating APIs into your applications. Deploying an integration is just the beginning. Now that your API integration is LIVE, it’s time you set up API monitoring. The ultimate magic of integration happens once your apps stay in sync. Use webhooks and polling to trigger actions, execute workflows and sync data. API Design is about developing apps with pre-built, pre-orchestrated integrations to complementary apps, but it’s more complex than point-to-point. Creating a cooperative app means product managers need best practices on API integration user stories. Compare a user persona to a system persona. Data Mapping process enhances your app's API integrations between apps by mapping custom and standard data fields to endpoints your customers want. When integrating to app endpoints like CRM, Marketing or Finance, you will use discovery APIs to discover standard and custom objects being used. Authentication is key to building API integrations to cloud services. Determine the type of mechanism (SAML vs. OAUTH), Access Refresh Tokens, etc. App Developers are frequently tasked with designing API integrations to cloud services, such as Dropbox, Google Drive, Salesforce.com, Jira and Quickbooks. Cooperative App API integrations generally follow a consistent pattern that you can apply when designing an optimal user experience.